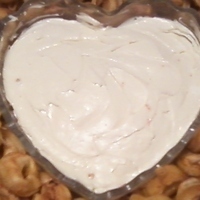 Place softened cream cheese in bowl. Add remaining ingredients and with a rubber spatula, fold and stir until well blended-about two minutes. Transfer to serving bowl. Refrigerate until ready to serve. This recipe is great with some stir-ins like diced red and green peppers, celery and red onions just to name a few. They add flavor and texture not to mention vitamins and fat-free enjoyment.